Regarding my being punished by what I consider to be “rogue” police, by being stalked constantly because I’m highlighting on this blog – and in many letters I send to UK government – the plight of one Carol Woods, I see now these “rogue” police, either in Lancashire [where Carol suffers their wrath by being constantly stalked] or their contacts down here too, have recruited neighbours who live alongside myself to surveille me 24/7 to pass on surveillance information via sms cell phone messages each time I leave my abode, to their fellow stalkers, to generally “keep an eye” on all my actions – as much as they can. Now, I realise that the postmen who deliver mail to me are involved also in my surveillance. I firmly believe the long tentacles of the rogue Lancashire police have now taken control of puppet police down here where I am in Bournemouth. I’ve suspected this for some time, but now things have been confirmed, as I am about to try and describe. The comment in the paragraphs below from the 5 October details the postal delivery through my letterbox of 2 small packets at a most unusual time of between 1 and 2pm on the 5th October, this delivery completely outside the normal and usual delivery time of around 11am each day. In the morning of the 5th, at the usual delivery time of 11am I received 2 packets from one of the 2 regular postman on the street, as I was entering my block, and he happened to be about to deliver the packets, so he stopped me on the street to save him the time and effort of entering my block and delivering the 2 items. After that event at 11am, strangely 2 further packets were put through my door, as I said, between 1 and 2pm of the afternoon of that day. Asking the other regular postman the following day, the 6th October, were there deliveries between 1 and 2pm on the 6th, this guy replied firmly “no – only in the morning when we deliver”. So, where did these packets come from, and who put them through my door hours after the normal delivery time? On the 7th October, the day after I enquired with the postman about the 2 late deliveries, the first postman who I got the 2 packets from at 11am on the 5th walked past me on the street as I was returning home, quite a distance away from my home. He walked straight past me, within inches, apparently on his mobile phone. As I crossed the main road alongside to get to the busstop [the same busstop where I’ve been harrassed so many times before by certain individual stalkers] this guy crossed the road 10 yards ahead of me also, and headed for the ATM cash dispenser in the wall by the local supermarket, mere yards from the busstop on the other side of the road I was going to wait at, and proceeded to interract with the device. I turned my back, whilst waiting for a bus, and when I turned around seconds later the individual was walking slowly away in the direction from whence we came. Was this entire event of all I’ve described above and below preplanned and a set-up – a manufactured event to see if I would interract with this postman? Was this a trap to see if I would snap and lose my temper with the frustration of having these idiots do the rogue police’s dirty work for them by, I believe, messing with my mail, and then parading in front of me – taunting me while the situation was still fresh in my mind? I believe so. These characters abusing their position as police officers would do anything to make me get arrested so they could say that my supporting Carol Woods was simply the work of another delusional criminal, thus losing credibility and kudos throughout my attempting to highlight the appalling situation Carol Woods is having to put up with all the time. 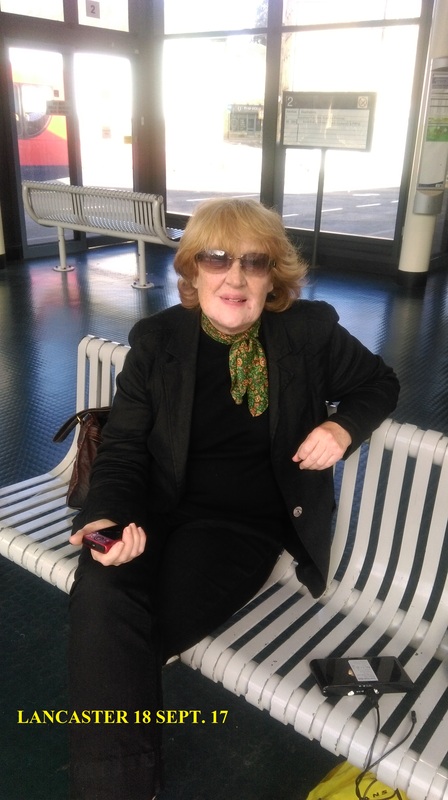 Indeed, Carol herself has been accused of being delusional and has also been arrested in the past on the most ridiculous of charges by the rogue police where she is – one example being their claim that she’d committed an offence connected to an airport that doesn’t even exist! It’s all part of the harrassment. Their problem is that their amateur dramatics are so transparent it’s more than easy to see exactly what their doing – to see exactly the smallminded mentality of the situation. As Carol said, these people doing the stalking are stupid – and boy, does it show..,. Incidentally, Carol Woods has had phenomenal problems with her mail being misdelivered to criminal neighbours or not being delivered at all for years. Despite making numerous complaints to Royal Mail, and numerous officials in authority, all is ignored. I know the rogue police who are behind the stalking here are in contact with everybody I deal with – from my doctor’s surgery to the postmen, to even the eye test people at the opticians where I have to go for diabetes eye screening – this has been obvious for ages. Things like this only motivate me to expose them all more. What a sick bunch they are. Below is the correspondence to and from the Post Office / Royal Mail about the postman advertising I’m not in when I don’t answer the door to his knock when I’m out. I spoke with the particular postman last week who did the shouting on the 2 occasions and had a lengthy conversation with him, and he told me no one had contacted him after my 1st complaint to them in early September – so he didn’t even know not to shout as he did again after I wrote to them the first time – thus setting him up for a complaint, which I did after he repeated his shouting a 2nd time days later. All this – all of it going back whatever time – will be used as part of the case when it gets to court and the miscreants are prosecuted, as they should be – for stalking and harassing Carol Woods – and now myself, courtesy of my rogue local police whose harassment towards myself began in 2010 – all is recorded and ready to go!! Bring it on!! Tuesday, 21 June 2016 DOMESTIC SURVEILLANCE – DAYS OF MY LIFE…with spooks. I wish to make a formal complaint as my packet i have been waiting weeks for was not delivered by R. Mail, nor was a card left at my home after TWO occasions of attempted delivery, which I find outrageous! The message i received from Austrian post which is selfexplanatory is directly below, with the relevant details also below. Thank you for your email to Rico Back. As part of Rico’s senior team I have been asked to reply on his behalf. I am very sorry to hear of the problems you have encountered with the delivery of an International item, reference number CD000346364AT, from Austria and I understand the concern this has caused. After checking the reference number on our website, I can confirm the item was passed to Parcelforce for UK delivery. I have therefore forwarded your enquiry to Parcelforce for them to investigate and reply to you. According to our database your shipment with the number CD000346364AT has been handed over to Royal Mail for further transportation in Great Britain. Unfortunately Royal Mail has not been able to deliver your parcel and it is therefore being returned to the sender in Austria. For more information regarding the delivery please contact Royal Mail or ask the sender to initiate an official inquiry about the matter at one of our post offices or online. We hope this information was useful. The sender has provided electronic shipment information. Thank you for contacting Royal Mail. I’m very sorry to hear of the problem you’ve had regarding deliveries by your Postman. I can certainly understand your concerns in this matter, so please accept my sincere apologies that you have had cause to contact us. • Logged and reported the full details of your complaint reference 1-4080965. • Passed these details to the Manager of the Delivery Office. The Delivery Office Manager will do all that is required to ensure you receive the quality of service you should expect in future. I trust this will ensure that, going forward, you will have no further incidents but should you have any further issues please let us know. Thank you for taking the time to contact us and once again, please accept my sincere apologies for any inconvenience this may have caused you. I hope that this concludes your enquiry but if you do need any further help please do not hesitate to contact us again. Dear Sir, I am reliably informed by other neighbours here that one particular postman – on finding I do not answer my door [because I’m not at home] to his now normal decibel level of knocking when he’s trying to deliver a packet – is resorting to shouting at the top of his voice “ARE YOU IN JOHN?” after his knocking. This shouting, I am reliably informed, has happened a few times when I’ve been out. With the current crime rate I find it preposterous this postman is advertising to the world that I’m not at home by shouting as he does. I have valuables in my abode that I cannot afford to have burgled by this out of the ordinary Royal Mail procedure. PLEASE stop this blatant advertising that I’m not in happening again. I’m very sorry about your recent experience with one of our colleagues. Our employees are trained to a high standard and receive continuous coaching, with a strong customer focus – so I apologise if you didn’t receive the high standards of service that we attain to on this occasion. I’ve logged the details of your complaint and passed them onto the relevant manager to action accordingly. Thanks for taking the time to report this problem, we’ll use this information to make further improvements. My apologies again for the obvious inconvenience caused. In the unlikely event you need to contact us again regarding this matter, please quote your reference number 1-4035116915. Please note I now wish to make a formal complaint about your postman shouting at the top of his voice “ARE YOU IN JOHN?” when he called today at approx. 11.10BST today Weds. 13 August – in exactly the same way a postman did when I complained recently [see message below]. I was lieing on my bed with a migraine attack unable to move when the postman knocked and then shouted. I have already explained my reasons why this shouting is unacceptable. I have asked already that your postmen desist from such practices, and now wish to make a formal complaint. Do I have to take legal action to stop this deliberately irresponsible behaviour? Q: when will it all end? But why the stalking and hostilities? Stalking is unwanted or obsessive attention by an individual or group towards another person. Stalking behaviors are related to harassment and intimidation and may include following the victim in person or monitoring them. The term stalking is used with some differing definitions in psychiatry and psychology, as well as in some legal jurisdictions as a term for a criminal offense. 2] Why am I a targeted individual who is being treated with such hostility by people I do not even know, and that I have hardly ever spoken to – some persons with whom I have NEVER even had a conversation with in all my life? In our opinion the reason for such antisocial hostility towards myself, a completely law abiding citizen, can be summed up quite simply by stating that I am supporting an elderly lady called Carol Woods, who is retired now and is targeted and gangstalked so very much worse than I am, by certain, we allege, government agencies and connected at her location in Northern UK, in Lancashire. Carol Woods in a 63+ years old lady – a former Level 3 Social Worker and Child Protection Officer, a former Probation Officer, and much more. She was a trainer of prospective social workers learning to be social workers. Unfortunately for all she discovered serious irregularities in her work as a social worker / child protection officer, and “blew the whistle” and exposed much of what she knew. The attached sheets describe some of her profile, and what is happening to her, which I have witnessed myself when visiting her also. 3] As a result of her whistleblowing, which, for example, detailed many irregularities involving children in care – the appalling hostilities against Carol began, which continue to this very day, some of which is detailed in the attached sheets. Carol’s home was taken from her, value £400,000 [with contents], and many more serious events occurred. Everything alleged in anything I state can be backed up, as most of what I say has come from Carol herself, who has the official and proper documents to prove all she – and I – allege, on her behalf. We allege those agencies are Lancashire police force, and also the county council, along with other connected agencies and organisations. It is safe to say Carol has been forced to live a life of hell, and has been illegally punished for so long – since at least 2006 when seriously evil things began happening to her by those who should know better. The numerous and serious crimes committed against Carol have, so far, been refused to be investigated, and I have lost track of the number of letters I have sent to not only the Dorset Chief Constable, but many other chief constables, and the National Crime Agency and the National Police Chiefs Council, and more. Attached are some responses to my communications. To get justice is one of our aims, but doing that is so difficult because powerful characters are involved who are, we strongly allege, acting very criminally, and have been for some years towards Carol, and now more recently, towards myself. I have documented much on my internet site “Victims of The State” [https://www.butlincat.com] where much can be reviewed. I ask every and anyone to look at the posts with “Carol Woods” in the title for the post – there are scores of posts, authored by Carol, myself being the messenger. What’s more, I doubt if anyone reading this can possibly imagine what Carol has had to go through since 2006, when her job was forced from her, and her home, and everything was taken from her. The evil targeting began by those anyone would least expect to commit such crimes – which continue to this very day – as the hostilities towards myself have been happening also. So, the main reason I am being treated as a targeted individual is because, put simply, I am trying to help Carol find justice, and I am despised for doing so, and publising her regular updates. The updates sent are also a form of diary – she records as much as she can regarding what is happening to her, by certain stalkers [many are neighbours to her home] who, it is alleged, are in the pay of certain rogue individuals connected to the government. Indeed, there have been even fake court hearings held where persons have impersonated Carol in order to deceive and abuse lawful process – she was awarded a tribunal payment which she never received as an “identification fraud” took place, which is still unresolved. Documents to qualify all I say, I repeat, are very much in existence, safely stored, which confirm all I say. Hopefully the end result of Carol’s quest for justice, and mine, will be borne out in a court of law, when everything, and everything connected, will be revealed to all – the many wrongs righted, and justice will be done, and the criminals who are acting so criminally and have hurt Carol so much will be brought to book. Many media have been kept up to date – the email list I have been sending to for much longer than since Febuary 2016 [on other matters] contains about 200 email addresses pertaining to newspapers and broadcasting media, reporters and connected agencies, along with legal representatives, and human rights representatives. Attached are some responses from some agencies written to pertaining to our quest for justice – much is ongoing, but everything connected to what is happening to Carol, and myself, is reported in some form or other. The courts are there for a purpose, and will be used when the time is right, when everything can be told. This is just one video from the list of very informative “IMPORTANT VIDEOS” shown below, with the UK Column’s Brian Gerrish interviewing Carol Woods, from March 2016. The video sees Carol explaining in detail, amongst other subjects: a] the failed “supercasino” project, which was an epic episode in irregularities in itself [also described by Carol here: York LGO Blog re Lancashire CC http://criticalreader2006.blogspot.ae/, b%5D the death of elderly Sheila Bridges, who died after a heart attack, [very strongly allegedly] caused by the actions of recruited and bullying yobs connected to the “supercasino ” project c] the death of former Greater Manchester police chief constable Mike Todd, who deceased after a judge David Williams, connected to the then Social Service’s Upper Tribunals department, was given a file of Carol’s evidence, d] certain Lancs. Social Services irregularities which saw Carol being hounded out of her job for refusing to alter records of vulnerable children connected to Lancs. Social Services, and e] Carol’s move to Lewes, Suffolk, under the advice of MP Norman Baker, which brought on much hostility aimed at Carol, including arrests by police, and the wrecking and theft of Carol’s home = “Child Stealing By The State – A Social Worker Speaks” https://www.youtube.com/watch?v=3noOtwoNo4Q – please see the other videos listed for more background on the atrocious targeting of Carol, which began in 2006 and continues daily now. What is particularly appalling also is that – apart from the Royal Mail letters not reaching Ms. Woods and ending up, via being misdelivered, to criminal neighbours, or letters being delayed delivery for weeks at a times – serious crimes committed against Ms. Woods have been refused being reported for years now, to the police and other government agencies, including the IPCC who do nothing when told about complaints involving Lancs. police. Apart from Ms. Woods continually contacting police departments and politicians and other government agencies, other supporters have contacted UK Government departments regarding the serious crimes Ms. Woods is victim of, I personally have approached 3 different chief constables of 3 different police forces to no avail, and the IPCC have been complained to regarding this lack of duty by police employees – the IPCC merely passing my concerns back to the force allegedly behind the bulk of so many of the very strongly alleged crimes – Lancs. police. Contacting these UK Government departments has proven a complete waste of time, such is the coverup involved to do with so much of what is very strongly alleged concerning Ms. Carol Woods. The question has been asked: “why would the “Powers That Be” target someone such as Carol Woods for so long [since 2006], involving so many perpetrators, committing so many serious crimes, funded by the public and local council taxpayers?”. Carol Woods is a 63 years old former Lancashire County Council Level 3 Social Worker and Child Protection Officer [who used to train social workers] and a former Probation Officer, amongst many other things. Perhaps the appalling and chronic targeting she has no choice but to put up with 24/7 is because she reported numerous seriously grave irregularities she discovered, including child abuse, when being employed by Lancashire county council, as described in the “IMPORTANT VIDEOS” at the foot of this post, and also because of what Carol has reported, especially here, from Feb. 2007: “York LGO Blog and Lancashire CC” http://criticalreader2006.blogspot.ae/. More is described here: “Harassment as punishment for whistle-blowing: Lancashire” http://criticalreader17.blogspot.ae/2017/02/harassment-as-punishment-for-whistle.html. When one realises that the very controllers of the targeting and stalking Carol is forced to endure are, very probably, very closely connected to the same departments and personnel who are described in the links above and the “IMPORTANT VIDEOS” shown below, which detail what was discovered when Carol worked as a Child Protection officer in Lancashire, then it should not be hard to understand these hostilities enacted against her. Put it this way: the Welsh scientist, weapons expert and authority on biological warfare, employed by the British Ministry of Defence David Kelly was supposed to have leaked serious information to the detriment of the PTB at the time – look what happened to him. Now, Carol is no weapons expert, but one doesn’t have to be one to upset the proverbial apple cart bigtime. And anyway, we are told there have been assassination attempts upon her life too – quite a few in fact, including ramming her car at speed, on a main road, by perpetrators unknown…well, almost unknown. For more posts on the Shocking Carol Woods Coverup please check the archives here and put “carol woods” in the “search box” on any page to see the rest of the scores of posts beginning in Febuary 2016. Thanks for your time! !